'Mona Lavender' is a fast-growing perennial shrub that's fast becoming a favorite house plant. This shade-lover is an exciting new cultivar that's perfectly suited to growing indoors. Few other plants bloom so dependably indoors, for so many months, and fewer still are as easy to grow as "Mona." Upright stems are densely covered with dark-green ovate leaves with toothed edges. 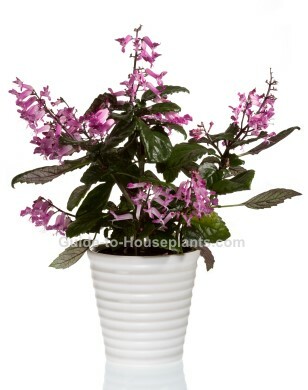 The glossy leaves are evergreen with purple undersides, making this a beautiful house plant year-round. Just when most plants are slowing down in autumn, this flowering beauty sends up tall spikes of tubular lavender flowers spotted with purple. 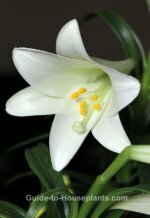 It's the shorter daylight hours that trigger blooming, so don't put it under artificial lights. You'll likely enjoy flowers right through the winter and into spring. Pinch and prune. Pinching off new stem tips will promote branching and keep the plant compact. (Don't toss them out -- you can easily propagate them for more plants.) Flowers grow at the tips of new branches, so you'll get more blooms this way. Also, cut off flower spikes when flowers have faded to encourage more blooms. Repot in spring after flowering is over. Move up to a pot only 1 size larger to give it a little room to grow. Use a pot with drainage holes to prevent soggy soil, which leads to root rot. Problems with this plant are few. Hot, direct sun and dry soil will kill it. You can keep your plant indoors year-round. But if you move it outdoors for the summer, keep it shaded from direct sun. Also, check the soil every couple days so that it doesn't dry out. 'Mona Lavender' is a newer cultivar. If you're unable to find it at your local garden center, ask for it. It's well-worth growing. You may find it available at online nurseries. Humidity: Average room humidity (around 40-50% relative humidity). Use a pebble tray or room humidifier, if needed to boost humidity around the plant. Temperature: Average room temperatures (65-80°F/18-27°C) suit this tropical plant just fine. Aim to keep it warm year-round. If you put 'Mona Lavender' out on the patio for the summer, bring it back in when the temperature drops. It won't tolerate frost. Propagation: Take 4 in (10 cm) stem tip cuttings in spring or summer. They'll root easily in moist potting mix or water. Sow seeds in spring.